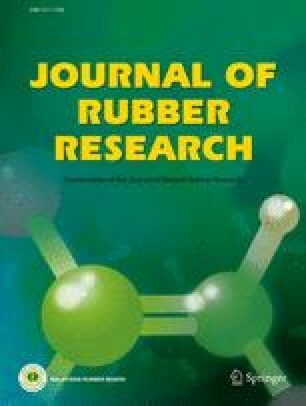 The original form of Natural Rubber (NR) has limited usage despite its excellent elasticity and reversible deformability. Further improvement of its undesired properties, i.e. low hardness, durability and tear resistance will allow for application of NR on a broader scale. Traditional reinforcing materials such as carbon black have indicated improvement in NR-based composites. However, the increasing range of newly emerging applications comprising polymeric composites motivates researchers to focus on developing NR-based composites with better physical properties. Many nanoscale fillers have been widely researched to attain extraordinary properties in NR based products. Among the different nanostructures, carbon nanotubes (CNTs) have been widely examined for NR modification.Addition of a tiny amount of well-dispersed CNTs to NR allows for significant improvements in physical properties of NR. Preparing nanocomposites comprising CNTs and other types of fillers also demonstrates enhancement of NR properties. Besides improvements in mechanical properties, the presence of CNTs considerably improves other properties of NR, such as thermal stability as well as electrical and thermal conductivity. However, owing to interactions between individual CNTs as well as CNTs and other components (NR or other fillers), property improvement varies depending on the type of fillers and their ratio in NR. This review summarises the reported processing conditions and property improvements in NR reinforced with CNTs as a solefiller or with other additive fillers. This paper will help to better understand the status of research on developing an NR/CNT nanocomposite and discover challenges and obstacles that need to be resolved.